A beautiful little river set in the northern end of the wet tropics with a magnificent back drop of spectacular mountains and rainforest. Good land based fishing can be had at the mouth, the local wharf or Weary Bay. A very adequate boat ramp can be found just up from the wharf but care should be taken navigating this river on a dropping tide. Good barra, jacks, fingermark, trevally, queenfish and salmon are caught regularly throughout the system but like most fishing timing is every thing. Plenty of deep holes, weed beds and snags to explore with lures, fly and live-baits. 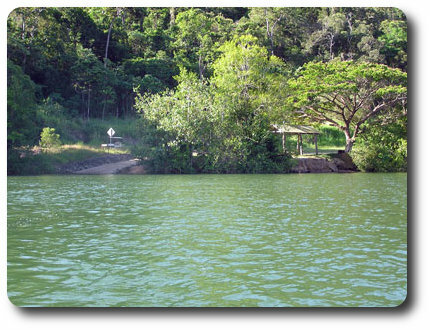 Hire boats and charters are available on this very dynamic tropical river and good camping/accommodation are available in Bloomfield and Ayton.